Anita De Mio Pol, 92, beloved wife of Elfo Pol of Orange passed away November 10, 2018, at her home surrounded by her loving family. Loving mother of Raymond Pol of Orange, Kenneth (Linda) Pol of Meriden, Lawrence Pol of New Haven, Andrew Pol of Milford, Michael (Laura) Pol of Onset, MA and Daniel (Laura Schumann) Pol of Washington, DC. 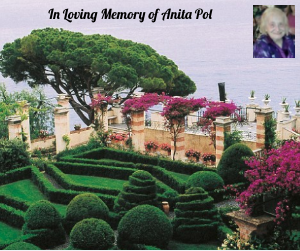 Anita was born in Caviola, Italy on November 27, 1925, a daughter of the late Augusto and Virginia Fenti De Mio. She is also survived by a brother Dante De Mio of Colorado Springs, CO, 7 cherished grandchildren, and a great-grandchild. Anita emigrated from Italy at the age of 12. She spoke no English when she immigrated, but by the time she graduated high school, she was a member of the National Honor Society. Prior to the birth of her children, Anita worked as an electrical engineer at US Motors. After successfully raising her 6 boys, she returned to the workforce, entering public service for the town of Orange. She held many posts, most notably as Tax Collector, a position she was elected to several times. Anita made lifelong friends through her work and many community activities, volunteering at the Orange Fireman’s Carnival and Country Fair, the American Legion Auxiliary, and playing bridge. Friends may call Thursday from 4-7 p.m. at the Porto Funeral Home, 830 Jones Hill Rd., West Haven. Her funeral procession will leave the Funeral Home on Friday morning at 9:30 a.m. A Mass of Christian burial will be celebrated in Holy Infant Church at 10 a.m. Interment will follow in St. Lawrence Cemetery. 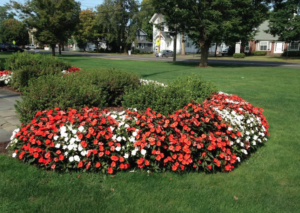 In lieu of flowers memorial contributions may be made to the American Legion Ladies Auxiliary Scholarship Fund, 630 Grassy Hill Road, Orange, CT 06477 or Holy Infant Church, 450 Racebrook Road, Orange, CT 06477.